For 25 years, Unifin has been providing its clients with high-quality financial services. By offering a broad spectrum of loan and leasing options, the company has established itself as one of the leading independent companies within Mexico’s financial services sector. Unifin’s rise hasn’t always been plain sailing, however. With the company having only been in existence for a year at the time, the Mexican financial crisis of late 1994 threatened to undermine Unifin’s early successes. With debt spiralling, company founder Rodrigo Lebois Mateos refused to let standards slip, prioritising quality service as a way of surviving in a challenging economic landscape. While many financial services companies in Mexico declared bankruptcy or ceased to exist altogether, Unifin paid back every penny of its debt, turning adversity into a vital lesson for future success. World Finance spoke to Sergio Camacho, CFO at Unifin, about how the company ensures it delivers excellence at all times, especially when the going gets tough. Can you outline what you do as a company? 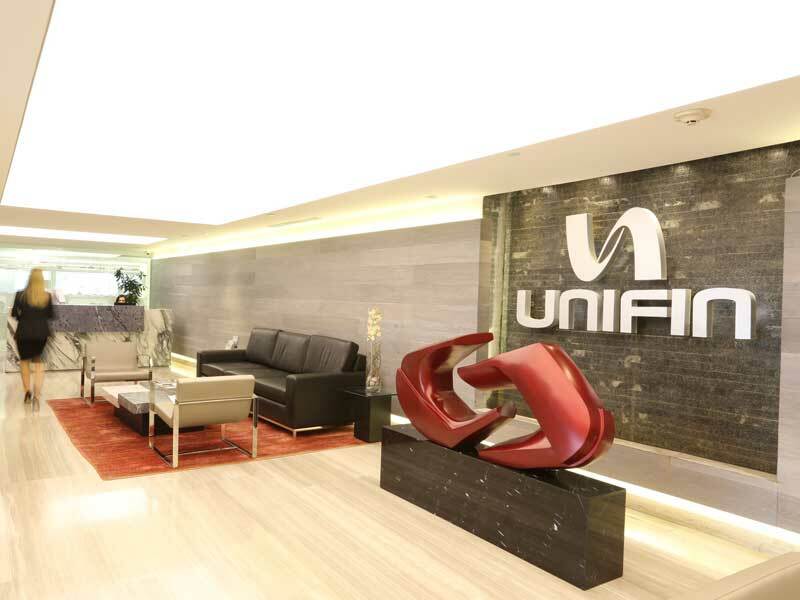 Unifin is the leading independent leasing company in Latin America. It has three main business lines that operate leasing, factoring, automobile loans and other financing solutions. Our main business is operating leasing for different types of machinery and equipment, transportation vehicles (such as cars and trucks) and other assets for a variety of industries. Through our factoring business, we provide financial and liquidity solutions, purchasing or separating out our clients’ receivables or, when necessary, their suppliers’ receivables. Unifin’s auto loan activities involve loans for the acquisition of new or pre-owned vehicles. Can you describe Unifin’s structure? Unifin Financiera has two subsidiaries: Unifin Credit and Unifin Autos. Through Unifin Credit we carry out factoring, as well as auto and other loan operations, while asset purchases and sales occur via Unifin Autos. Unifin Financiera has three main management pillars: business, operations, and administration and finance. We pride ourselves on having high standards of corporate governance, fostering a strong feeling of trust among customers and investors alike, and ensuring that we comply with all the necessary regulations that apply to publicly traded corporations. Unifin also possesses a highly experienced management team with best-in-class processes. Our board of directors is made up of highly experienced independent members who are part of diverse, well-known companies such as Chevez Ruiz Zamarripa, IXE, KUO, Citibanamex, Deutsche Bank and Promecap. Regarding its corporate governance, Unifin has 10 committees that gather periodically throughout the year. Similarly, the board of directors and our audit and corporate practices committee meet quarterly. The finance and planning, systems (IT), communication and control (anti-money laundering), marketing, and corporate credit committees meet monthly, while the portfolio management team meets weekly. Finally, the two committees that meet most frequently are the electronic credit and credit committees, which meet every 24 hours and twice a week respectively. In what ways does this structure support good governance? Unifin’s structure supports good governance because it enables each committee to oversee specific issues and report back its concerns so that no problem goes unattended. One of Unifin’s greatest strengths is its solid corporate governance and its adherence to all the relevant regulations, complying with the high standards issued by the Business Coordinating Council in its Best Practice Code. We support good governance practices by having an experienced management team, as well as having the proper mechanisms and structures to support its operation. These include the adherence to a strict code of ethics (grounded in the corporate values of quality, service, commitment and honesty), which, alongside our regular committee meetings, ensure that all of our employees strive for the highest possible standards in their daily interactions. What is the composition of the Unifin board and what expertise do its members have? Unifin acknowledges that strong corporate governance has been a key driver of our success. Unifin’s board of directors consists of 50 percent independent members, which brings impartiality and a freshness that far outweighs any constraints. Our board of directors and management team have broad experience in the financial services industry, having previously held positions with banking institutions, as well as with financial factoring, insurance and other lending firms. Our board is highly specialised, knowledgeable and with diverse experience as C-level officers. The continuing support of our shareholders has also been a significant contributor to our sustained growth. We believe that our management team, board of directors and controlling shareholders are key differentiating factors for the company, particularly with regard to their knowledge, experience and support. What measures have been taken to analyse risk and create a corporate strategy? We have historically issued debt and equity securities through public offerings under the supervision of the Comisión Nacional Bancaria y de Valores (CNBV), Mexico’s banking and securities regulator, which requires us to comply with high standards of corporate governance, mandatory reporting guidelines and other regulations as a publicly traded corporation. Indeed, we have employed PWC as our independent audit firm for many years. We believe this distinguishes us from other non-banking and privately held competitors and creates a high degree of trust among our customers and investors. As mentioned previously, our board of directors currently comprises 50 percent independent members, and we have also established an audit and corporate practices committee that is comprised entirely of independent members. Our audit and corporate practices committee is responsible for the approval, review and amendment of the general guidelines for our internal controls and audit. Our management is responsible for implementing and monitoring our standards of internal control to ensure the integrity, reliability and timeliness of our financial information. Our operations are supported and regulated by an enterprise resource planning system, which monitors and registers our operating income. Our internal control system is based on the segregation of responsibilities, and its processes are in accordance with our internal policies and applicable law. We have an internal audit team, which has developed an operating risk management methodology and framework that allows us to identify, analyse, quantify and prioritise possible loss events. This also allows us to establish the proper actions to mitigate, transfer or assume operating risks, and to monitor and control risk in a standardised manner. Can you give examples of how you keep up a high level of communication with shareholders, investors and analysts? We are proud to say that Unifin is a very transparent company. We are proactive communicators that are always open to talking to our investors and stakeholders, and we publish public notices whenever necessary. Since we are a publicly traded company, we are in part supervised by the CNBV, which requires us to comply with high standards of corporate governance and the release of relevant information to the market, as well as many other regulations. How do you ensure transparency with shareholders? Unifin strives to ensure communication with all its shareholders, either by being available via telephone, through email, arranging face-to-face meetings, deal and non-deal roadshows, conducting annual shareholder meetings, or sending notices to investors. Through these and other mechanisms, the company ensures that minority shareholders are heard and their concerns and opinions are voiced. Which committees regulate Unifin and how do they work to ensure its prosperous growth and sound financial health? In a sense, all committees help with regulatory oversight and ensure the company abides by the highest possible standards in everything that we do. Additionally, Unifin’s Audit and Corporate Practices committee is responsible for the approval, review and amendment of the general guidelines for our internal controls and internal audit. Moreover, to avoid and dissuade any form of bribery or corruption, we have implemented several control processes that begin at the hiring stage to ensure all job candidates comply with our stringent code of ethics. Regarding anti-money laundering and terrorism financing prevention, we are required to comply with all applicable laws and regulations. These require Unifin and its subsidiaries, among others, to adopt and enforce Know Your Customer’ policies and to report suspicious and large transactions to the relevant authorities. Such regulations have become increasingly complex and detailed over time and require effective control systems and highly qualified personnel for the supervision of and compliance with such rules. What is your strategy to ensure prosperous growth and financial health in the years ahead? Unifin excels at being extremely prudent in the underwriting process and, as such, each of our clients receive a detailed and in-depth analysis. This process starts at the prospecting stage and continues through a credit analysis based on Unifin’s robust scorecards. We take into consideration the portfolio management platform and access the client’s electronic information, utilising credit bureaus, legal bureaus, banking references, as well as their SAT (Mexico’s tax administration service) history. The company builds all of its contracts on a robust legal framework and strengthens this further through a legal deposit. All of these approaches, in addition to substantial investments in IT, have helped to ensure Unifin’s robust financial health.